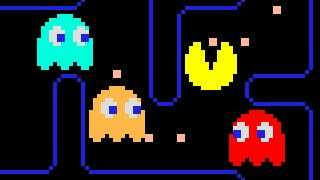 The man who created Pac-Man three decades ago says he has a vision for the next version of the venerable dot eater. He wants Pac-Man to sing a song. "I'm thinking of the next version [of Pac-Man], the next evolution," game designer Toru Iwatani said at his GDC 2011 Pac-Man post mortem. "I'm thinking of a Pac-Man that's singing. I don't want to make it musical, really. I don't want to make it 'Chicago.' 'Blues Brothers'? Maybe." Iwatani walked GDC attendees through the origins of Namco's famous ghost-chomping mascot, saying that he originally wanted to make a game that women and couples could enjoy playing. At the time, Iwatani said, he thought of arcades as a boys' playground—they were dark and dirty, and including female players would hopefully make them "cleaner and brighter." He focused on idea of eating, thinking that girls "love to eat desserts" and developing characters that were "kawaii" or cute. He made those ghosts blue, red, orange and pink to make the game more colorful, less "furious." Iwatani said that one woman, the president of Namco at the time, disagreed with his colorful cast of enemies. She wanted every ghost to be red. Iwatani disagreed so vehemently that he conducted a survey of Namco staffers to see whether they preferred his varied ghosts or a quartet of all-red specters. He says the results were "fifty to one" in favor of Inky, Blinky, Pinky and Clyde being multi-colored. Pac-Man's creator showed the original hand-drawn sketches of the game's maze, death animation and timing and pathways of ghosts.